Close-up of materials needed for tutorial. 1. 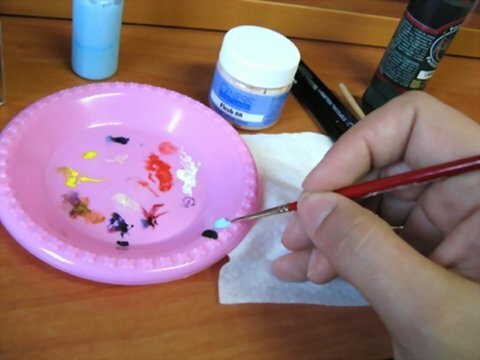 Start by using almost no paint (I use red Genesisï¿½ Artist Colors) to blush the cheeks. Enlarge Picture to see the blushing technique. 2. 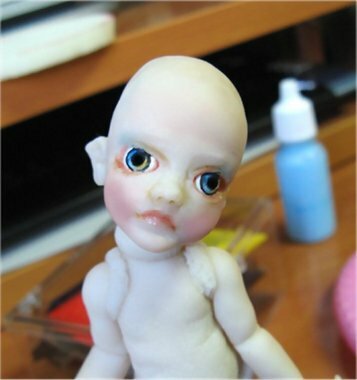 Using the same paint, blush on the forehead and chin. Enlarge Picture of additional blushing. 3. Smooth and blend all areas with a dry paint brush. Enlarge Picture of dry brushing. 4. 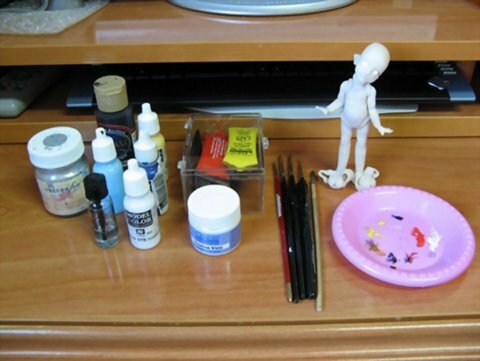 Next you'll need the sienna coloured paint (again I use Genesisï¿½ Artist Colors paint). Enlarge Picture of paint color. 5. 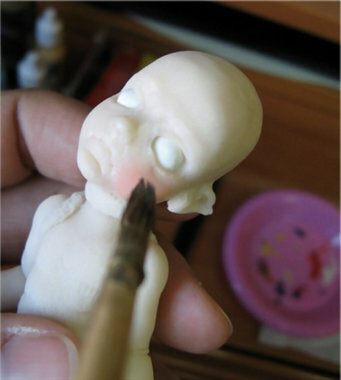 Using the sienna paint create and define the upper eyelids. Enlarge Picture forming the upper eyelids. 6. 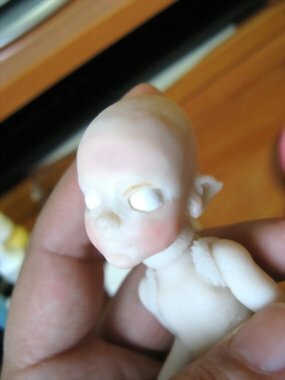 Put a little bit of Sienna paint color on the nose and under her mouth as well. Enlarge Picture of highlighted nose & mouth. 7. Add a little more to the mouth as needed. Enlarge Picture showing additional highlights to mouth. 8. 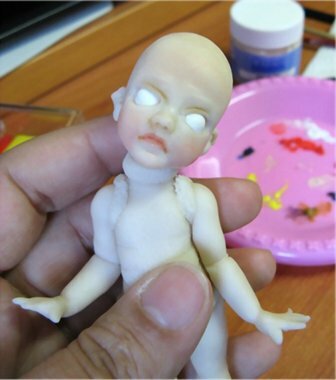 Next, paint the lips with a fine layer or red paint. Use just a little bit here. Enlarge Picture showing the painted lips. 9. Get your blue paint next. 10. 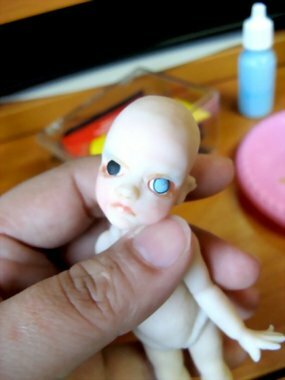 Now we'll highlight the upper eye lid with blue paint, again I use blue Genesisï¿½ Artist Colors, creating an eye shadow effect to match the eye colour. Smooth with a dry paint brush when done. Enlarge Picture to see highlight above the eyes. 11. 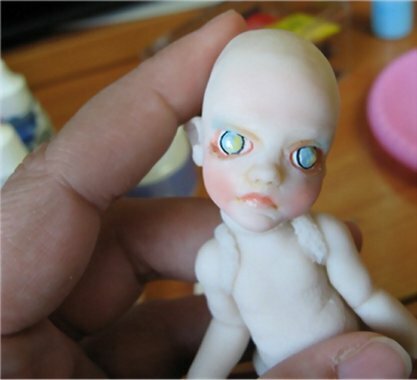 Now put some red veins around the white eye balls to (to be more realistic). Enlarge Picture of veined eyes. 12. Highlight under the eyes with some sienna to give a shadow effect. 13. You are finished with the whites; she will look this way (see picture)! 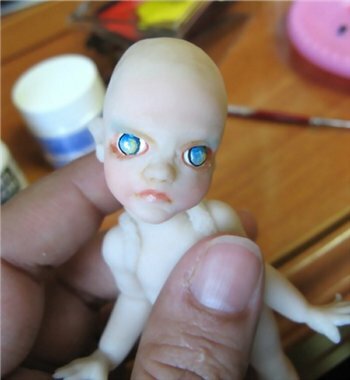 Enlarge Picture to see completed whites of the eyes. 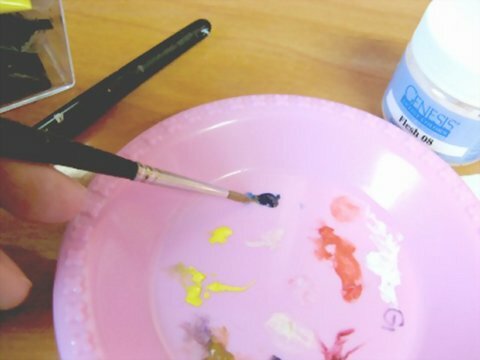 Clean up your tools & brushes with acetone and some cotton. 14. 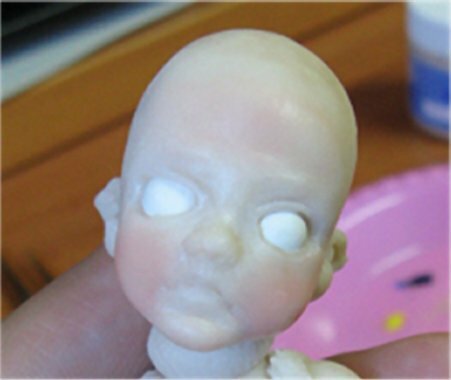 Now you need to plan where your doll will be looking; once decided start making a big round black (acrylic) ball for the pupil. Enlarge Picture to view painted pupil. 15. Repeat on the other eye. Enlarge Picture of repeated pupil. 16. 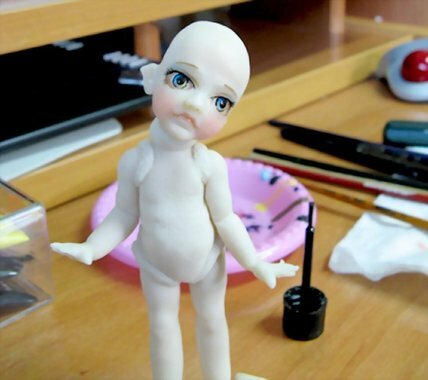 Next, you will need the light blue acrylic paint. Enlarge Picture of acrylic blue paint. 17. Make a large round blue ball within the blackened pupil area, making sure that the "black" of the pupil encircles the blue. Enlarge Picture of color of the pupil. 18. Repeat on the other eye with the same steps! Enlarge Picture of both pupils colored blue. 19. Next, get the acrylic yellow paint. Enlarge Picture showing yellow acrylic paint. 20. 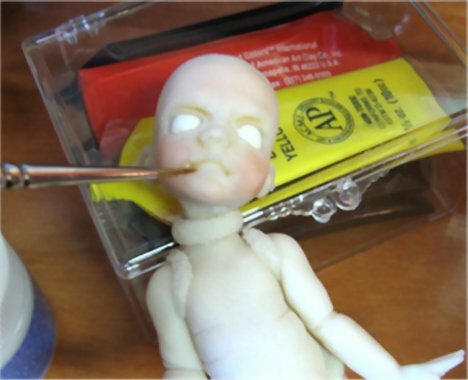 Paint the light side of eye with yellow paint; don't forget to smooth it over with a dry brush. Enlarge Picture adding yellow to the eye. 21. Do the same with other eye. Enlarge Picture showing yellow added to eyes. 22. 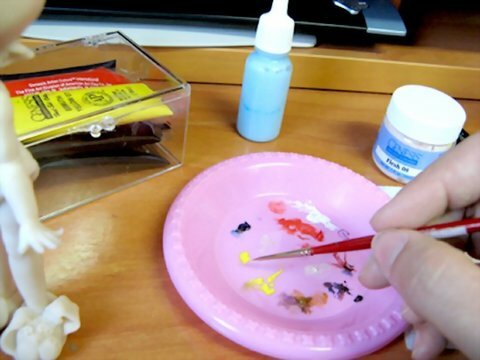 Apply some silver acrylic paint to the opposite side of yellow. Enlarge Picture showing silver paint added. 23. Put a little deep blue acrylic paint right above the area where you painted the silver color; then smooth. Enlarge Picture showing deep blue paint added. 24. 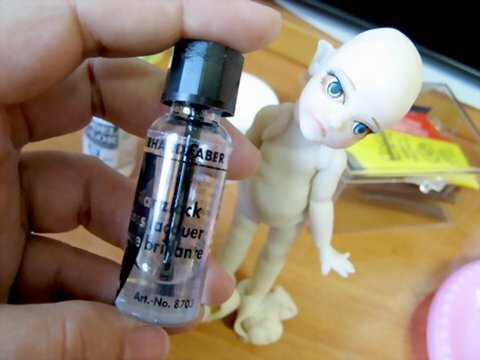 Using the black paint, using the small paint brush create a round black ball for iris. Do this on both eyes! Enlarge Picture showing the defined iris. 25. 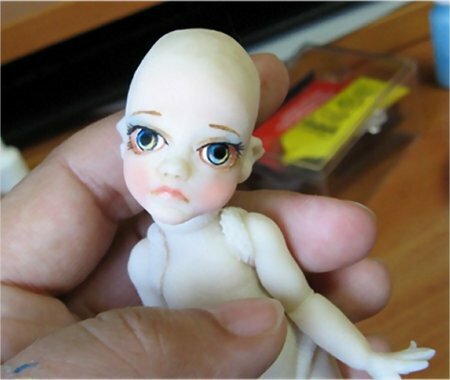 Next create the eyebrow. Using the Genesis or acrylic paint, whichever you like best. Enlarge Picture of created eyebrows. 26. Now we will make the eyelashes with a fine brush. Start in the conner of the eye and work your way to the other side. Only make one fine line at a time, working to a larger line until you get to the middle of the eye, then start making short lashes. 27. Repeat on the other eye. 28. 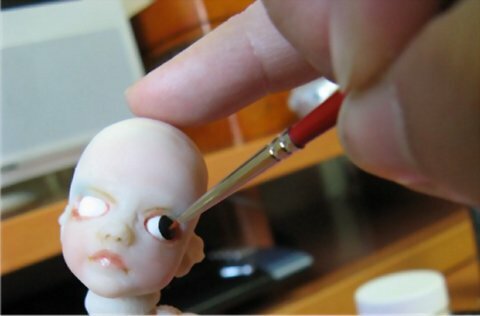 Place a drop of Fimo gloss in the eyes. Then a second drop to create the lens of the eye. Using the the Fimo, gloss lips. Take your time. Enlarge Picture showing Fimo Gloss. 29. 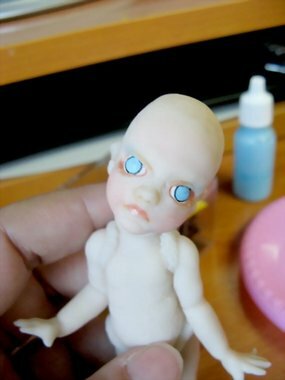 Her eyes and face are done !!!! Enlarge Picture showing finished face. 29. 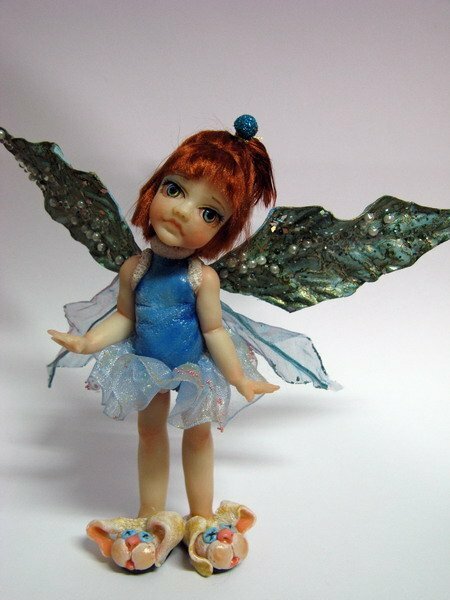 Completed "Doty" the Fairy Doll !!!! I hope you like and enjoy !!! 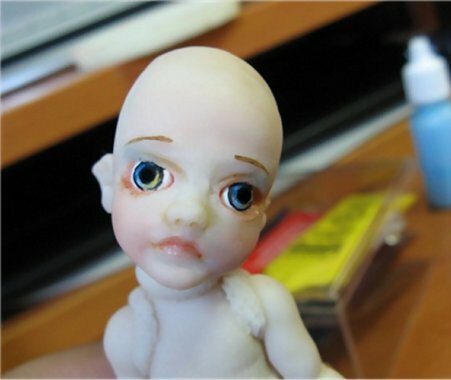 Enlarge Picture of finished painted face and eyes. 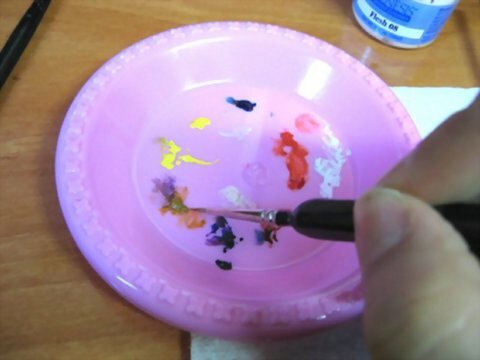 Eneida is a professional Artist, specializing in porcelain painting which she teaches weekly classes in. Another talent she has is finding beautiful white porcelain furniture for dolls houses and painting in many styles of traditional porcelain patterns. 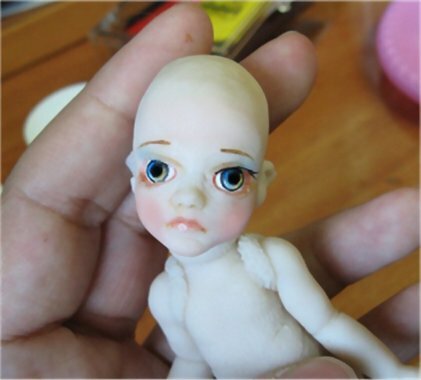 A new interest she has discovered is working on original, one of a kind (OOAK) dolls house size paintings. 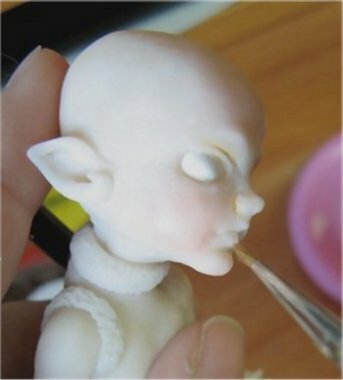 Eneida started working with clay a few years ago and found that she could paint the fine details needed in this artform and discovered a new love for OOAK fairies. Eneida Rosa is a valued member of the CDHM Forums. Visit the Galleries today. Reproduced with permission from Eneida Rosa. All photographs and text appearing in this tutorial are the exclusive property of Eneida Rosa. Permission is explicitly denied for any republication of text or photographs in this article without the prior express written consent of the author.